Morrison trying to take credit for Hakeem’s release. Craig Foster interviewed just now..
Did Morrison say that Shorten wouldn’t of got him out? Jeffemu, no he didn’t, but I was waiting with bated breath for him to blame Shorten and Labor for it though. Bemused was the one causing all the discord and nastiness around here. That’s why we got rid of him. Everything’s perfect now. Yes to going behind the claim of self-incrimination. The court could find no criminal act from person refusing to answer questions and order they be answered. I was in a case where a police officer declined to answer questions before a coroner about a high profile shooting and the process was the subject of three appeals before he had to answer. Bragging about who you block is quite clearly bullying. If the statement is made in concert with others expressing similar sentiments, it’s mobbing. All hands on deck in Victoria for the Libs. I never had a problem with Bemused, he seemed more a victim of bullying than a perp. Although the victimhood on here would argue with that summation no doubt. 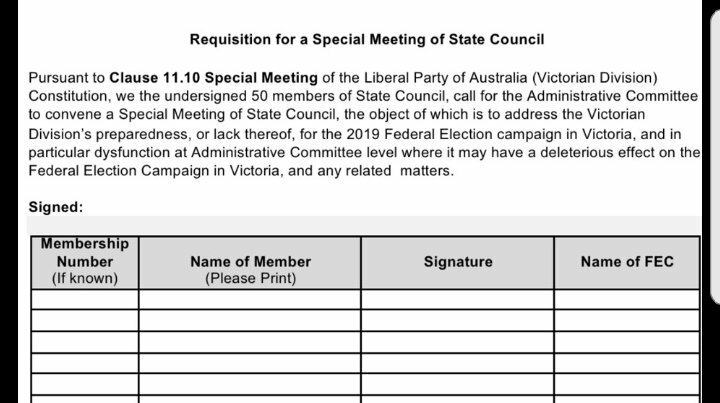 Imagine how differently history might have played out if the Victorian Liberals had sorted out their admin committee. I’ve got some worms to share! Because Morrison is an opportunistic grub. There may be some justification for the PM and/or the FM to make a statement or hold a presser but Morrison cannot do it without making himself look like an opportunistic grub. There is not much he can do that does not make him look like and OG. Maybe because he is an OG and he just cannot keep it hidden. Ha, ha that me laugh Puff. Funny, but sad also. This petition has over 70 signatures and will advance. it’s probably the most exciting thing happening in Victorian Liberal circles this year. Four days til the shutdown deadline in the US and many govt workers are still getting back on their feet after the last one! It makes you recall that saying about how most people are 2 paychecks away from homelessness. Mark Dreyfus being on QandA tonight is going to be interesting. We will get a good idea of Labor thinking. Hopefully Jones won’t interrupt the explanation too much. Well William, maybe they would have lost by an wider margin. Maybe sorting out the Administrative Committee meant getting even more RWRNJ preselected? On the contrary, it’s not an ancient grudge; as I intimated, I found it hilarious. Where we part, however, is your apparent attempt to take the high ground, following on from the interdictions of William. I am bragging about whom I block, just that I avail myself of that facility and it is there for people who complain about others, and that I like the word block too. It was useful during some previous Bludger wars. And William. I am setting the record straight. I am NOT bragging about whom I block, just that I avail myself of that facility and it is there for people who complain about others, and that I like the word block too. It was useful during some previous Bludger wars. Somewhere in excess of 1.1 million children and adults participate in soccer in Australia. Add in the numbers of club volunteers and parents, it the most popular participatory sport in Australia. My club has around 1700 players during the winter season. Is Craig Foster Union leader of the year? Isn’t Warren Mundine on Qanda tonight? That could be interesting…. Craig Foster looks actually happy. And that is very refreshing. Yep, you are right about that Goll. I reckon that football will become the main code within 50 years. I can see AFL dying. It is in real trouble. As a teacher, I rarely see kids having a kick at lunchtime and discussion of AFL in the staff room is now a rare occurrence. Kids see players earning 200,000 pounds a week in the EPL and representing their country in football and to them it’s a no brainer. Although I was mowing the lawns this morning I managed to hear much of Mirrison’s speech on the ABC Listen app. It was a Big Brag from start to finish. He set himself up as the Saviour Of The Nation. He’s going to rescue everyone from citizens in Bourke St mall to Battered Wives. And let’s not forget Retirees, from whom Bill Shorten (did he mention Bill Shorten? Only about a million times. Someone probably told him the Worm took a dip at every mention of the name) will be stealing their nest eggs. ScoMo has redefined security: shelter from Evil, from wherever the Devil drops it off, be it economic, domestic, Muslim, climatic, or just plain Bill Shorten. So now he’s saved Hakeem from Teh Evil Thais and the Dastardly Bahrainis. But no matter who you vote for, no-one likes a braggart. What (rightfully) should have been a positive for ScoMo, he has turned into a negative. No I think Mundine changed his mind about appearing. Tony Wright on Scott Morrison. Nailed him. Or had his mind changed for him more like. Seems Sarah Henderson is the Liberal on tonight’s panel. Wonder what happened there. I knew the Victorian Liberals were in trouble the moment I saw that Nick Demirius was at the helm at the last state election. He was a thug in his Uni days and remains one. The tactics he deployed were straight out the Young Liberal play book circa 2004 – and the ALP knew that too as their admin came from the same era of student politics – they read it like a book. It’s certainly not looking good for the LNP in that seat. He’s another Tory gift that keeps on giving. Mediawatch doing Daley Hotline Story. Looks can sometimes be deceiving, but not in thus case. The Government faces its first defeat in the House. Di Natale apologizes unreservedly for calling Rudd a “sociopath”. People have been predicting the demise of Australian football for as long as I can remember. Last time I looked it was still going ok.
Soccer is growing and that is a good thing as is the female participation in both sports. Last zealot who told me Aussies rules was dead and there would only be one AFL team in WA in less than a decade was a Rugby Union man. Anybody remember the Western Force? First question from a refugeebon Nauru. Morrison with today’s “I’m pumped” sounds a bit like company owner and salesman Big Kev and his trademark “I’m excited”. Except that Big Kev was selling cleaning products and Morrison is selling fear and loathing. So Labor is asking for Clafication but voting for the Bill.